The Twin Cities metro area needs more housing. The Metropolitan Council estimates that the area will add roughly 233,000 households to the population by 2040. Cities around the region are grappling with the question of where to build the housing they will need, as they draft plans that will guide their growth for the next 20 years. The discussion has been especially heated in Minneapolis, as the city tries to accommodate a growing population while confronting a zoning code that's historically hurt racial minorities. At a recent community meeting about Minneapolis' draft comprehensive plan — known as Minneapolis 2040 — someone in the audience told Heather Worthington that she is the most hated woman in the city. "I'm used to being yelled at and I don't take it personally," said Worthington, the city's director of long-range planning. "I really believe in practicing radical compassion." Worthington is in the process of gathering feedback on drafts of the 2040 plan from across the city. Since the city released the first version in March, her office has received more than 10,000 comments. Some came via email, others were written on sticky notes, and some were yelled into microphones at the nearly 50 community meetings held to discuss the proposals. The feedback, so far, has been mixed. "For every person that has given us a comment that would be contrary to the current plan, we've received several that would be supportive or told us it doesn't go far enough," Worthington said. The plan includes nearly 100 policy recommendations that touch on everything from climate change to racial equity to economic development. But one proposal has received the most attention: allowing up to four residential units — fourplexes — on any plot of land in the city. If that part of the plan becomes policy, people would be able to turn a basement, attic or garage — or even all three — into a separate apartment. John Edwards, the co-founder of a group called Neighbors for More Neighbors and a resident of Minneapolis' Wedge neighborhood, likes that idea. "I think Minneapolis is on the cutting edge," he said. "Other cities are learning from us." Edwards and his Neighbors for More Neighbors colleagues consider themselves YIMBYs ("Yes, in my backyard") — the opposite of NIMBYs. Edwards said he thinks people should welcome more density as a way to lower housing costs and reduce carbon emissions. Urbanists in other cities are impressed by Minneapolis' proposed move toward that idea because virtually every other major city in the country has neighborhoods where only single family homes are allowed. 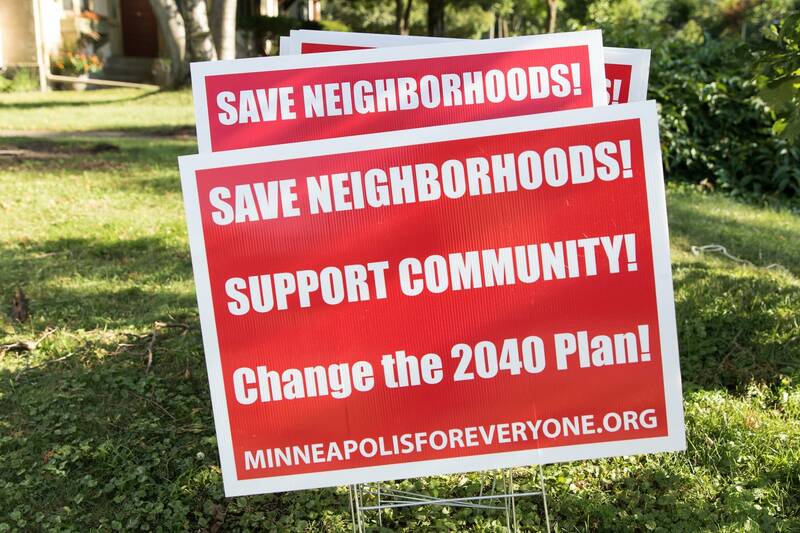 In its latest draft, the Minneapolis 2040 plan would allow fourplexes across the city, and not just in certain neighborhoods. But the plan is just that: A draft. It's not a done deal. And plenty of people are trying to stop it. Carol Becker, the co-founder of the group Minneapolis 4 Everyone, is one of them. She lives in the Cooper neighborhood on Minneapolis' eastern edge. 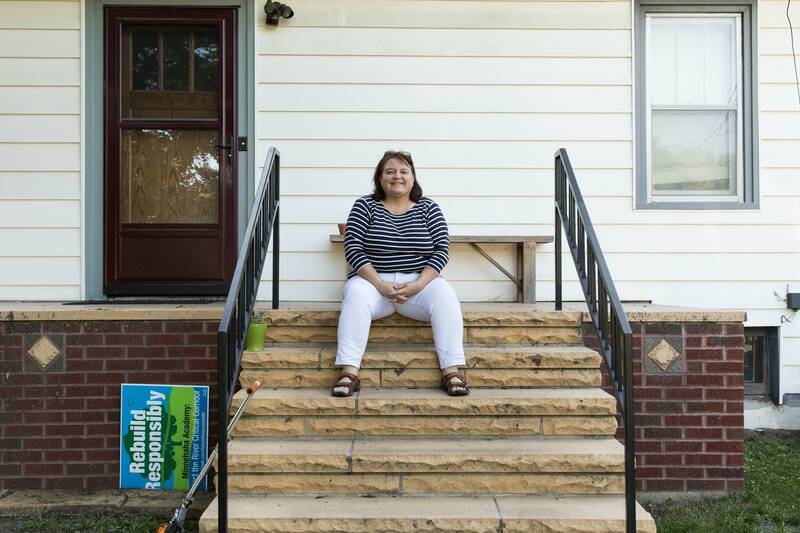 "My neighborhood was built 100 years ago," she said. "Those are the kind of things you want to save, because it makes us unique and different. If you just started sticking up fourplexes all over the place, you might as well put in McDonald's." Becker and her group have made many of the yard signs popping up around the city, warning of bulldozers. They worry the comprehensive plan proposal would lead to developers tearing down neighborhoods. They argue that the city has plenty of space to build new housing. "East Lake, come on down," she said, referring to the area along Lake Street that runs east of I-35W and toward St. Paul. "We have lots of space for a lot more housing. ... You want to build a single-family home? They will give you a lot up in north Minneapolis." The city owns about 400 vacant lots in its northern neighborhoods. It does have programs to encourage development, but it doesn't actually just give them away. City Council member Phillipe Cunningham represents Minneapolis' Fourth Ward, which covers half of north Minneapolis. He said his constituents aren't especially excited about fourplexes in their neighborhood, either. "Trust me," he said. "They do not want it here." He says he's not opposed to the proposal, but he doesn't want density just for density's sake. He wants to see it paired with policies that will spur homeownership and economic development in his ward. And he said the fear of neighborhoods being bulldozed is a false narrative. 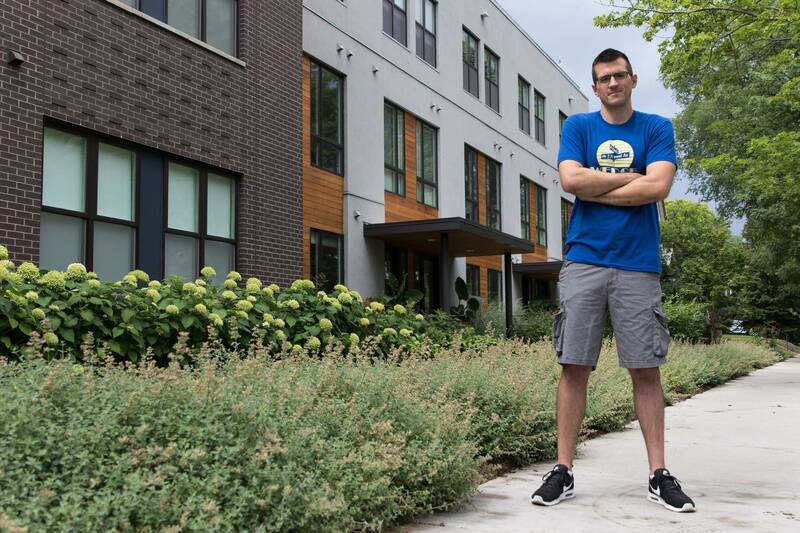 "As far as I know, there is nothing in the comp plan whatsoever that says [to] tear down people's cute, single-family homes and build super expensive fourplexes," he said. "[And] the idea that folks need to protect their neighborhoods, so [new builders should] just go to the northside, that is how we got here in the first place." Historically in Minneapolis — and in cities across the country — multi-family housing would invariably end up in areas like north Minneapolis: neighborhoods that are generally poorer and have more people of color. In the 1960s and '70s, Minneapolis restricted development in sections of the city, largely in south Minneapolis, to single-family homes only. That code has remained largely intact, even to today. "It effectively kept poorer people of color out of those areas, because you couldn't rent in those areas, and they didn't have the financial capacity to buy homes," Worthington said. Minneapolis is trying to avoid replicating that history when it rezones the city this time around. That means a change from what's been the norm for decades. "I think it's safe to say [that] if you're an older person living in Minneapolis and you've owned your home for more than 20 years, this plan is generating quite a bit more fear than if you don't own a home and you just moved here a few years ago," Worthington said. Minneapolis' comprehensive plan is far from complete. Worthington will release a new draft in late September, taking into account those 10,000 comments she's received. Then, it goes before the planning commission and city council who aim to approve the plan by the end of the year. Editor's note (July 27, 2018): This story has been updated to further clarify the next steps in the Minneapolis 2040 process.